UBS, last year's leader in Asia Pacific M&A deals, says the fierce competition for wealth managers and investment bankers in Asia is driving up costs, and thus driving down margins. According to Alex Wilmot-Sitwell, co-head of UBS's Asia-Pacific operations, "Staff expenses are increasing faster in Asia than in any other region." As a result, he says profit margins will decline for the next two years. Of course, many banks, and not just UBS, are vying for bodies to take care of business in Asia, especially in China -- where, says Wilmot-Sitwell, "there's wealth creation today on a scale that's never been seen." Last year, UBS grew its Asia Pacific headcount by 6 percent to 7,263 people; it plans to continue that pace this year and next. One of the biggest areas that UBS and other banks hope to take advantage of is the link between wealth management and corporate advisory. 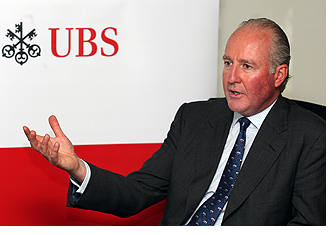 "UBS wealth managers and investment bankers can win work for one another from the family-owned businesses that dominate many Asian nations, according to Wilmot-Sitwell. Such so-called cross-selling revenue may double to 1.5 billion Swiss francs in the next four years, he said. 'Much of the private wealth we manage is linked to business ownership and capital markets activity,' he said. 'If we join that up properly, then we have a huge opportunity.'"